In 2009 Khan obtained his BS (Hons.) in Petroleum Engineering followed by an MS degree in the same discipline from KFUPM, KSA in 2013. 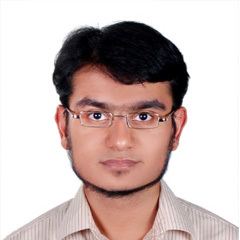 He has been positioned as a Lab Engineer at CPG, KFUPM since 2016 after employment as a Reservoir Engineer at Schlumberger (2013-15), Research Assistant at KFUPM (2010-13), and an Intern – BHP Billiton Pakistan (2008). B.S., Petroleum Engineering (Hons. ), University of Engineering & Technology, Pakistan, 2009. “Revisiting Reaction Kinetics and wormholing phenomena during Carbonate Acidizing” by X. Qiu, S. Khan, S. Dyer and A. Sultan, presented at International Petroleum Technology Conference, 19-22 Jan, 2014, Doha, Qatar. “Investigation of Core Length and CO2 Phase Effects on Propagation of Wormholes in Carbonate Rocks” by S. Khan, A. Sultan and S. Dyer presented at SPE Annual Technical Symposium and Exhibition, 21-24 Apr, 2014, Al-Khobar, Saudi Arabia.